Now let′s test the real power of Rank Tracker. 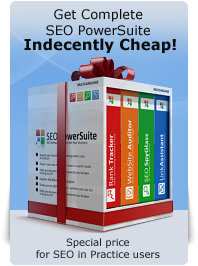 As you have the tool, it′s a must to check your rankings by keywords with it. An important thing in any business is to make sure you′re going the right way. SEO is no exception (remember the friend of mine, that bookstore guy who nearly lost 90K in an SEO campaign?) And for this purpose Rank Tracker reports are very illustrative. You′ll remember my words after the next check, when you see you′re moving up in the Search Engines. Just select the keywords you wish to check, and use the Check button in the Keywords tab to make Rank Tracker work. After it′s done with checking your rankings, you can switch to the Keywords tab to see how high are your site′s today′s rankings for the keywords you chose. As you go on with this guide, you′ll check rankings from time to time to view your progress. The software will keep record of every check, so you′ll see in detail how fruitful your job is — all in the clear–cut Search Engine ranking reports. What′s also so good about it, it doesn′t necessarily ask for a Search Engine′s API key. And, a great solution to the multiple queries problem is its smart human emulation feature. This cutting–edge function makes working with Rank Tracker safe and Search Engine–friendly. Additionally, with Rank Tracker you can now check keyword positions specifically for each country your business serves, select the rank tracking depth, check your positions in Google Universal Search results, where listings from news, video, images, local and book search results are blended! And take my word, you′ll love Rank Tracker just like I do. It animates the daily grind so much! DO IT NOW! 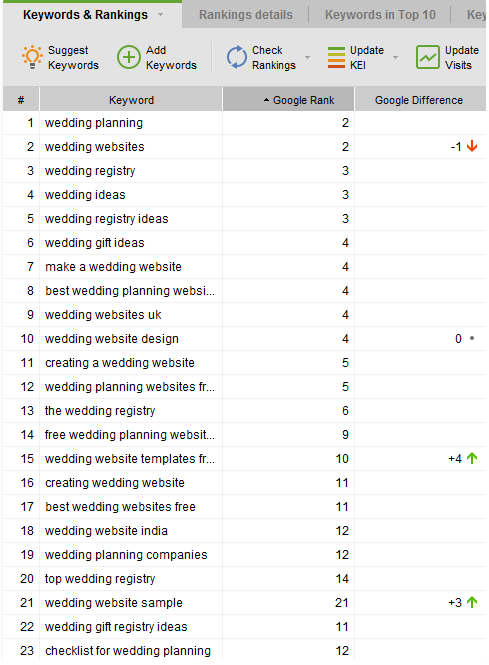 Check where your site ranks today for your major keywords. Make your first ranking report and keep it, so you can compare your results later. In what time interval the position of the site should be checked? The positions do not change very often, so it is ok if you check them once or twice in a week. Appena acquistato il prodotto e wow, che un ottimo strumento! Quindi sarà questo passaggio analizzare interi vostri siti in piedi per parole chiave selezionate? O semplicemente l'URL home page? Io non sono chiare su questo. The software will pick up all ranking URL of your website, not only the homepage. For example, if you have a page of your site (domain.com/html.1) or any other page found on SERPs - the software will pick it up and show in the report. If you have further questions, you should contact Link-Assistant.Com Support for the assistance. Please, contact Link-Assistant.Com support(http://www.link-assistant.com/support/) and describe the issues you have with the software. I'm sure, the guys from support will help you. I would recommend you to write to Link-Assistant.Com support(http://www.link-assistant.com/support/) and ask them for the solution explining the situation with your blog.